I have written about this report at length elsewhere (Parts I II III), and will not reiterate that material here. At the point where the Board considered this matter, the Premier’s proposed transit network had been announced, but many details had not been clarified. The Ontario 2019 Budget had not yet been tabled in the Legislature. The City Manager, Chris Murray, answered questions, but did not make a presentation as this material was covered in detail two days earlier at the Executive Committee. The city hopes for a collaborative relationship with the province, but as of April 11, had not met with the working group of city, TTC and provincial officials to better understand the implications of the Premier’s announcement and the two letters from special advisor Michael Lindsay. The City Manager will report to Council’s April 16 meeting, and will include an update on negotiations with the province. On the same meeting agenda, TTC management proposed extension of the tunnel design contract for the Line 2 extension (SSE), and there was concern that this approval might result in wasted work because of provincial changes to Toronto’s plans and/or that the TTC could face extra costs for work that will be discarded. The City Manager replied that recent discussions with the province focused on the use, to the greatest degree possible, of design work that has already been done. TTC staff replied that “99%” of work on the Line 2 extension would be applicable to the provincial project. This is difficult to believe considering that, for example, construction to Sheppard and McCowan would allow relocation of many bus links to the new terminal and the massive station at STC may not be required as currently designed. There is also the question of the exact alignment of the extension at STC compared to the work to date. Any changes and their effect on design funding will be the subject of a future report. The short-term concern is to ensure that the project team is not disbanded because existing funding would run out at the end of the month. On the subject of joint project governance, Vice Chair Heisey raised a matter he has previously advocated that there should be Toronto representation on the Metrolinx Board. The City Manager will report on this idea at some point, but not necessarily on April 16. There is a fundamental problem with this idea in that the Metrolinx Board is as much for show as substance, and the real decisions about transit at the provincial level come from the Premier and the Minister of Transportation. Management proposals sail through the Board unmodified, and there is little sense that the Board engages in an adversarial way with their staff. The dynamic would be quite different if Metrolinx were responsible for Toronto transit matters, but there were substantial disagreements between Toronto and Ontario. It is difficult to see how Toronto reps on the Board would make much, if any, difference. The City Manager agreed that GO Transit would be taking responsibility for a much larger transit operation, and that this would be a “tail wagging the dog” situation. Heisey noted that much of GO Transit is operated under contract, not directly by Metrolinx, and that the TTC has much more in-house expertise in operating a large system. The underlying issue, of course, is that Ontario might eventually seek to shift operations to an external company, and this could well be the model for the proposed Ontario line that would be physically separate from the existing subway. When the City Manager’s update on negotiations with the province is available, I will review it in a separate article. Unless the Board decides otherwise, a public presentation (deputation) has a five-minute time limit. There are currently no restrictions on the number of Board agenda items a person may speak on, the number of public presentations on a specific agenda item, or an overall time limit for public presentations. The staff review recommended retention of the existing provisions which allow an unlimited number of five minute deputations, subject to various rules about content, and also subject to the Board’s ability to modify speaking times on a meeting by meeting basis. The right to participate in Board meetings through a public presentation is not an absolute right. The TTC Board has the authority and discretion to limit (or eliminate) public presentations provided that the discretion is not arbitrary or exercised in bad faith. Currently, the TTC Board through the adoption of the previous Bylaw to Govern Board Proceedings has permitted public presentations and has placed a restriction of five-minutes per speaker per item on those presentations. The current permission to allow for public presentations is based on the Board, in controlling its own process, allowing for those presentations and is not based on an absolute right that the public has to participate in Board meetings. Although it is within the discretion of the Board to amend the rules relating to public presentations to further limit the total amount of time an individual may speak during a meeting, staff are not recommending any changes to further limit public presentations. The current requirement which limits public presentations to five minutes per item (only on an Action Reports) is consistent with the current practice of the City of Toronto. The Board agreed with this position. Notably absent from the list in item 8 is anyone, including those who might be appearing as deputants or as guests (e.g. Councillors who are not Board members). They have no “personal privilege” in the parliamentary sense. The one and two ride tickets would extend the two-hour fare now enjoyed by Presto cardholders to riders paying “cash” although this would only be available on the adult tariff, not to students nor seniors. The Day Pass will only apply to a single person, and the existing Group Pass functionality for weekends and holidays will disappear. Several questions arose about fare media and Presto functionality. The new tickets will have an expiry date that will be three months in the future for single ticket sales, and one year ahead for bulk purchases which must be in units of 400 tickets. The need to expire tickets comes from a Presto architectural constraint. All Presto readers must “know” about valid ticket serial numbers, and there is a limited amount of storage in these devices to maintain this list. One can only wonder why Presto cannot deal with a range of ticket numbers all of which would have a common expiry date, rather than tracking individual tickets. The Day Pass tickets would be valid within a window of 3:00 am to 2:59 am based on when they were first “tapped”. Some Board members asked why this could not be an open 24-hour ticket from whenever it was first used, a common arrangement found in other cities. The staff response was that this is how Presto works. I would also observe that the paper Day Pass has a similar behaviour and it does not confer 24 hours of travel, only from the day it is validated to 5:00 am the following morning. The Presto version more-or-less duplicates this function. If the TTC wanted a 24-hour ticket, then that is what they should have asked for, but the emphasis has always been on duplicating existing functionality. The 400 ticket bulk purchase requirement (over $12,000 worth of tickets in one go) would be an onerous burden for social agencies who now give out free tokens. There was considerable discussion of how to deal with this problem, and a suggestion that the City, through its relationships with these agencies act as the buyer and then resell the tickets in smaller quantities. There is a related problem of refunding expired media, and the process for this needs to be worked out. Meanwhile, the TTC has decided to keep tokens available for the foreseeable future so as not to disrupt existing bulk distribution of transit fares. There was a small side-show to this debate on the question of refunding unused tokens. Tokens, of course, do not expire and the only reason one might want a refund is if a person or agency had a hoard of them and wanted cash back rather than simply using them. The policy of not refunding tokens, except in unusual circumstances, dates back over a decade to before the current bimetal tokens when there were serious problems with counterfeits. Another obvious problem is a situation where someone hoards tokens before a fare increase and then seeks a refund at the new higher price. As for the Presto contract, as the discussions wore on, members of the Board became increasingly incredulous of what Presto does not do, and the degree to which Presto is or is not holding up terms of its contract. The agreements are available on the Metrolinx site. At the end of the debate, the Board asked for a staff report to the June 12 meeting on Presto fare policy options and a status update on the program including “matters and schedules that have yet to be agreed upon”. It appears that the Board has never been briefed, even in private, on where the gaps lie in functionality Presto is or is not delivering, nor of what the TTC should be able to obtain under its agreement. This is further complicated according to staff by Presto’s current move toward an account-based system from the current scheme where all of the transactions occur between Presto cards and readers. The implication is that Presto does not want to implement new functions on a system they might be changing significantly. For as long as Presto has been an issue at the TTC, all public reports and debates have been full of, if not praise, then at least guarded optimism because criticism of the program and of the competence of the team running it have not been a topic for polite public discussion, whatever TTC staff might say off the record. This appears to be changing if only because the TTC Board, finally, wants to know what is really going on. The proposed changes to routes in the Junction area was approved by the Board with little debate. The new route structure will be implemented in the fall of 2019. 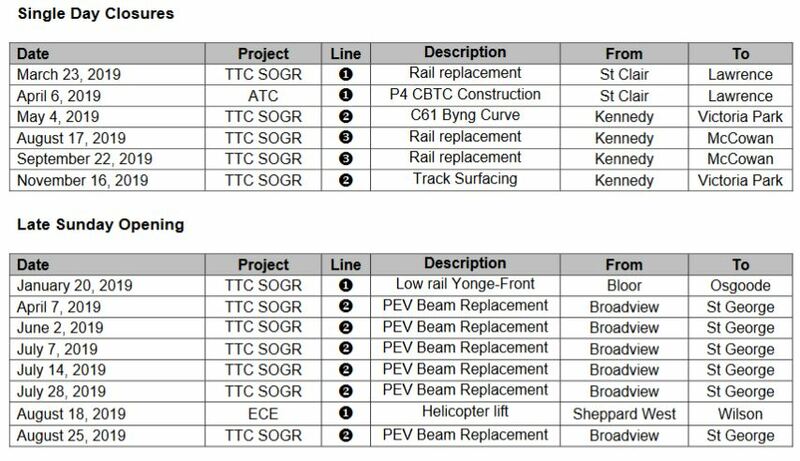 TTC management has proposed a long list of closures to permit work to proceed on many overlapping projects of which the most significant are the implementation of Automatic Train Control (ATC) on Line 1, and work on the Eglinton Crosstown (ECLRT) that can only take place when Line 1 is not operating. The full report explains the background for the closures, and includes the lists below. Note: These dates are subject to change, and riders should refer to current information on the TTC’s Subway Closures page for up-to-date information. 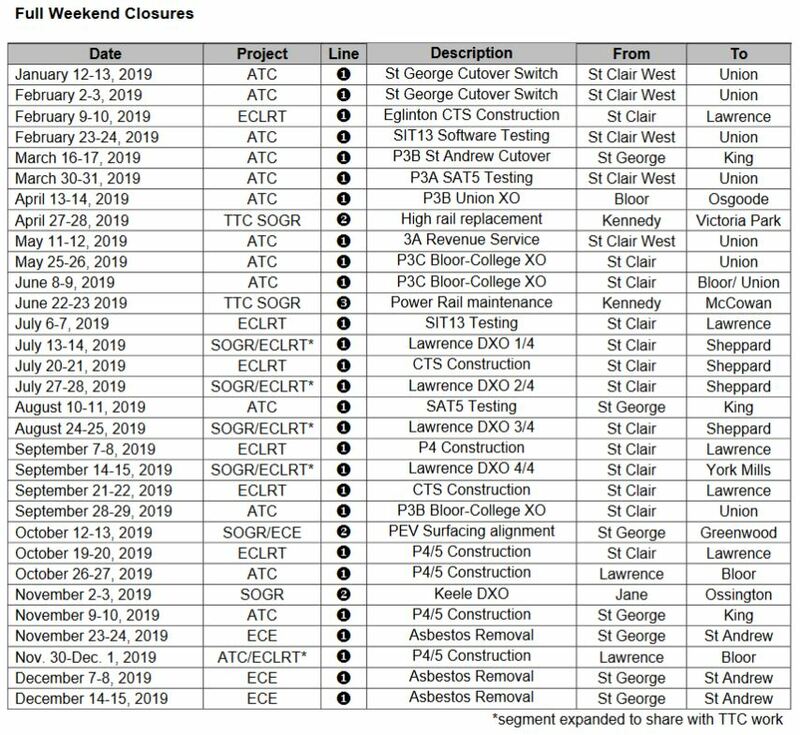 Full weekend closures see the affected portion of the subway close for all of Saturday and Sunday. 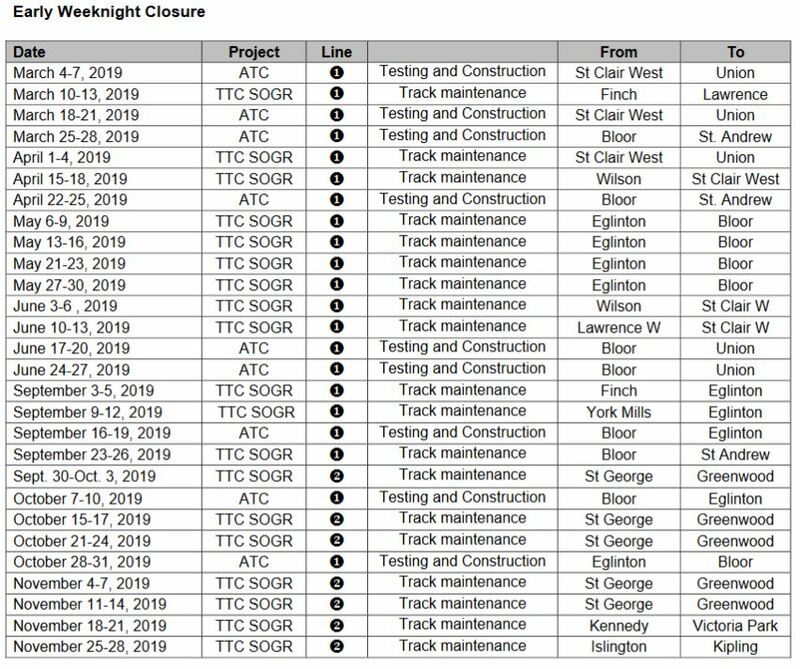 Most of these are Line 1 closures for ATC work which will progress “around the U” from Dupont to Rosedale throughout 2019. The weekend of May 11-12 is earmarked for conversion of the section from Dupont to St. Andrew station to ATC revenue service. The double crossover at Lawrence Station will be replaced over four weekends, and these shutdowns will occur at the same time as work at Eglinton Station for the Crosstown. There are a few single day closures mainly for rail replacement. Late Sunday openings primarily affect Line 2 when beams are replaced on the Prince Edward Viaduct (PEV). Six of these are done each year and an extended work period is required to complete one beam between the end of service Saturday night/Sunday morning and midday Sunday. It is common for these jobs to complete early, but the closures are scheduled for a longer period so that riders do not expect subway service before it will reliably be available. Early weeknight closures began in 2018 as a way to get an extended overnight work period on the less-busy evenings. These typically begin at 11 pm rather than waiting until after 2 am when revenue service normally ends, and they support both the ATC signals project and track maintenance work. This entry was posted in A Grand Plan, Fares & Fare Collection, Scarborough RT/LRT/Subway. Bookmark the permalink. Was the geographical extent of the King Street transit priority western extension named or hinted at? 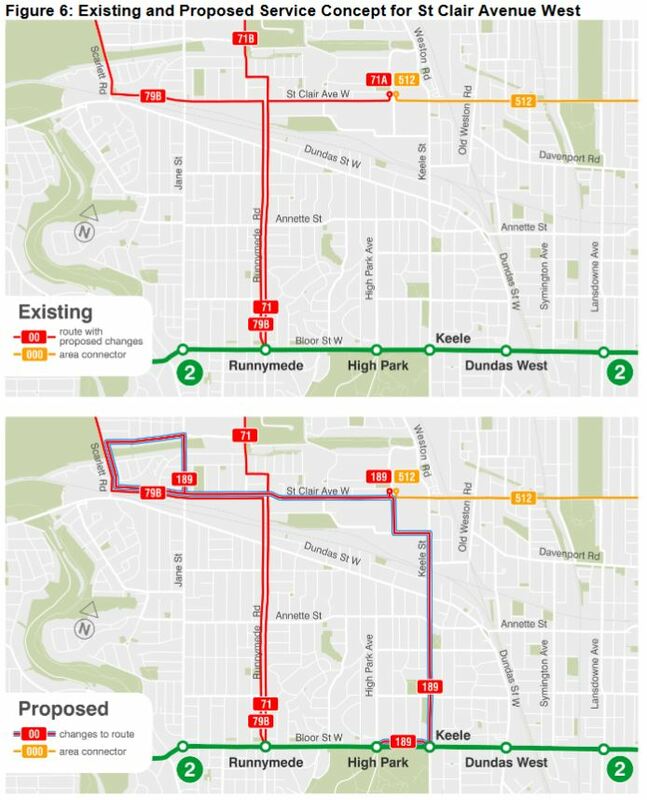 The stretch between Atlantic and Dowling would IMHO greatly benefit, but there aren’t very-near parallel routes to take the traffic as is the case east of Bathurst so it would be a substantial change. I suppose Bathurst to Strachan might be feasible in Toronto’s traffic politics. Steve: Shaw was one suggestion, but it was left to staff to come back with an update. West of there, especially as far as Dowling, gets into problems with parallel traffic routes and the use of street parking. It’s not primarily a commercial strip west of Dufferin or so. Did you actually mean “Dufferin” and not “Dowling” above? There are big problems with traffic queues at Jameson, and also at The Queensway westbound. Another consideration would be how King and Queen streets would operate during major events at the Ex including the Indy, sports at BMO field and the Ex itself. I have noticed a number of new Nova Hybrids lately. I had never heard of the TTC acquiring them and thought thy might be mentioned in the CEO’s report. I also expected news on the status of the new electric buses from China which I understand are due for delivery about now. What do you know about either of these items, Steve? Steve: The TTC switched over to ordering hybrids as a transition to an all-electric fleet, and the last “clean diesels” were delivered last year. The Chinese bus from BYD are late. See the CFO’s report starting at page 25. I meant west to Dowling because it seems to be it’s always super slow around Jameson. Though mostly it’s the bigger intersections, isn’t it? Queensway, Jameson, and Dufferin, and then Jefferson to Shaw to an extent because the rail line breaks the grid and concentrates traffic that then wants to turn. Not the same situation as downtown. I think the problem is every Presto device has to store if every ticket has been used or not. The expiry is so that the status of older tickets can be removed to free up space for newer ones. They should be able to bring the data down to one bit per ticket, but that might require a bit of clever programming that Accenture would change a lot for. Steve: The “have you been used” status is stored on the ticket along with the timestamp. This is essential to enable the two hour fare at successive devices along a trip. Would it be possible to extend Front west between Bathurst and Dufferin to provide an alternate route from cars if King pilot is extended? 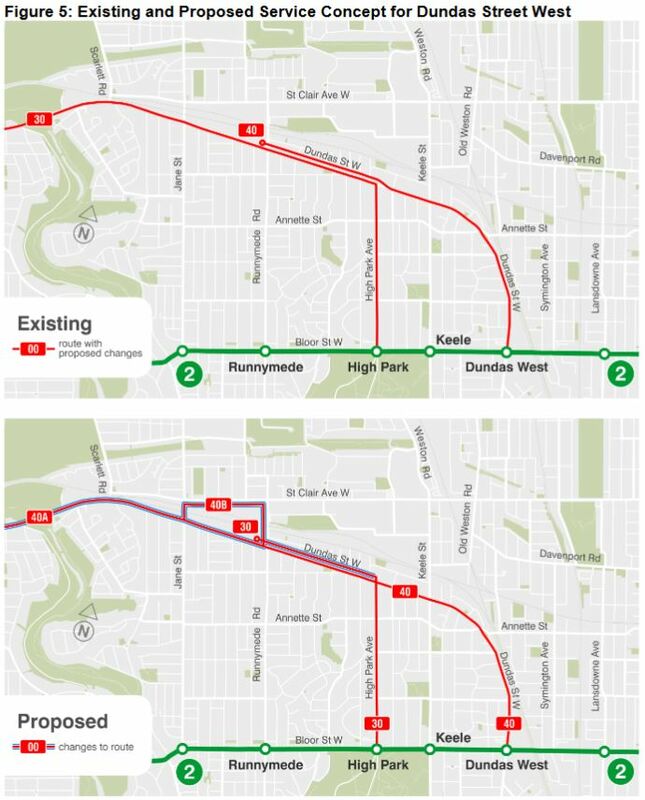 Steve: Aside from the fact that there are already plans to extend west from Exhibition to Dufferin Loop, the time taken to turn off of and back onto King would offset savings. The segment from Bathurst to Dufferin also does not exhibit as much variation in travel time as the part east of Bathurst used to, although there are some queuing problems eastbound to Bathurst and, to a lesser extent, westbound to Dufferin. Regarding extending Front Street to Dufferin. There is a plan for “Liberty Village New Street” at south edge of Liberty Village just north of the rail line, however it is to be limited to right-in-right-out at Strachan, which would seem to preclude connection towards Bathurst. at intersections of King with Sudbury, Shaw, and Strachan (possibly more). They would have been put up since the weekend. It’s a real shame they’re ditching the group day passes. I get that it’s not trivial to make them work given Presto’s architecture, but there must be a reasonable workaround / stopgap they could deploy. As it stands, for a family going to the ROM, the price of parking is essentially the same as a day pass. With this change, it’s 65% more expensive for the family to take the TTC. Even for a couple it’s now a lot more expensive to ride for the day. If the city truly wishes to ward off the effects of climate change they should find a reasonable option to keep the group pass going. Maybe a certain LUM card could be set to hold the gates open longer or something. Or groups can only enter the subway via the main entrance. I’m sure there is some way of making this work.